BSBI‘s annual New Year Plant Hunt is a great way to experience this, as well as contribute your data to a national recording scheme. Everybody is welcome to get involved – even if this is just spotting a daisy on the lawn or gorse flowering by the roadside on your way to work! I’ve walked the same New Year Plant Hunt route at the beginning of each month since January 2017 and thought it would be interesting to view the results of the January 2018 hunt in the context of the year passed. I would caveat this by saying it is very sketchy data to base any assumptions on so this should be considered ‘observations and possible trends’ rather than anything more robust. It is a single transect, over a single year in a single geographic location. It is also along a route which is incidentally prone to the machinations of land owners and council contractors being focused on streets, parks and carparks. This means that species which I know to have been in flower can disappear from the record because somebody has tidied up the only place in my transect where they grow. This could account for gaps in particular species which does not actually have any reflection on their ecology! Furthermore, these records may relate to a single individual with a single flower being found on the transect – it has nothing to do with abundance or dominance. I found one tatty cow parsley in flower in January 2018 but there were swathes of them flowering in April 2017 – presence may relate to exceptions and outliers rather than reflecting standard flowering ecology. There are a number of species I picked up on the 2018 New Year Plant Hunt which I had found in flower every month of previous year along the same transect route. In all, 50% of the flowers I found in January 2018 had been recorded flowering along the transect in 9 or more months during the previous year. The species recorded in every single month were daisy, ivy-leaved toadflax, white deadnettle and shepherd’s purse. Alongside these were a number of species where I had only missed them in either one or two months in the previous year – these included annual meadowgrass, sun spurge, oxford ragwort, common chickweed, snapdragon (naturalised), yarrow, Guernsey fleabane and petty spurge. The ‘Constants’ – these were from photographs taken throughout the year and not taken on the day – the dark start and lunchtime rain made photography difficult! Interestingly, the missing months when I hadn’t found these individual species in flower were clustered around March/April time but in all cases, they had been consistently in flower since September. This could indicate a flowering season which is all year round, or could represent a long flowering season which begins in the late spring and continues to early spring depending on the winter weather for duration. 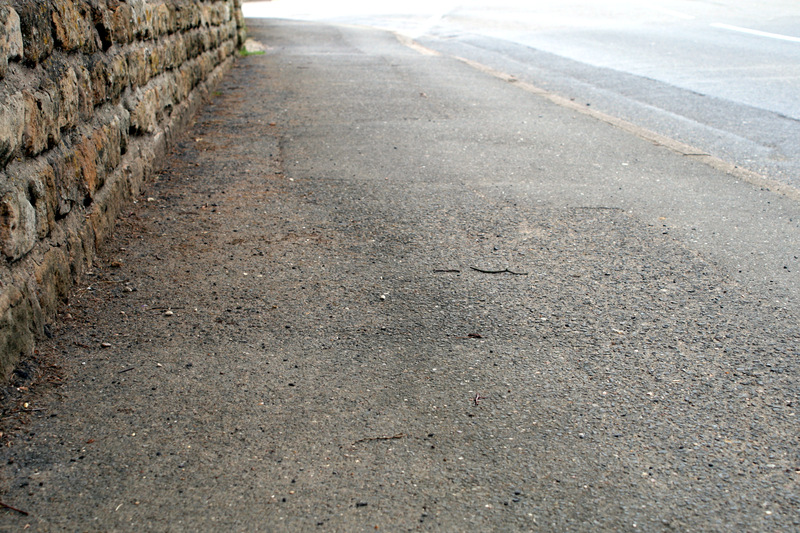 It could also represent an anthropogenic phenomena I noticed which was that winter ‘weeds’ were often ignored in January to March but a colony was often wiped out when the weather warmed up and people turned their attention to de-greening the edges of pavements! Those species found flowering in only nine months in 2017 continue the distribution trend noticed in the near-constants – feverfew and hedge mustard were found in January 2017 and 2018 but disappeared between February and April 2017 to then reappear and remain for the rest of the year. Hedgerow cranesbill and wall barley similarly disappeared between February and May and have been constant since. Species with a lower number of records, perhaps considered more late-season than long-season, appeared in later-summer/autumn 2017 and persisted through the winter to January including bramble, blue fleabane and Canadian fleabane. The long- or late-season specialists – these were from photographs taken throughout the year and not taken on the day – the dark start and lunchtime rain made photography difficult! These would accord with previous interpretations by BSBI scientists who concluded that most of the New Year Plant Hunt finds in 2017 were hangers-on from the last season rather than early arrivals from the new season. Late flowering and long flowering species might be expected to be particularly prone to this. Several species recorded showed a markedly winter flowering period – winter heliotrope being the key example but alder and oragan grape also according with this pattern. Naturalised wood spurge and greater periwinkle also fit into this category, though their season seemed longer. Cow parsley and bittercress both showed a predominantly spring flowering pattern, but with sporadic flowering during the winter months as well. Red dead nettle showed an interesting distribution – it went missing in the middle of the year between June and September but remained fairly constant otherwise. This almost indicates a winter-flowering strategy but with a much longer timeframe than things like alder which appear in flower only for a month or two. 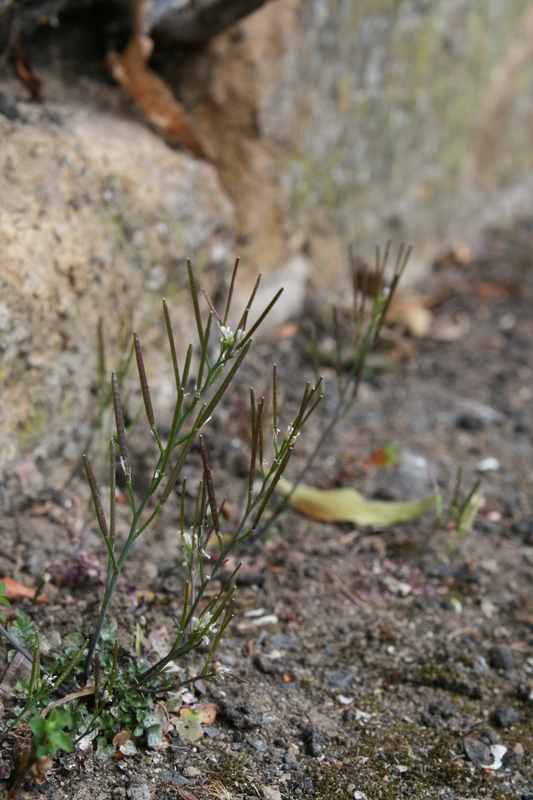 It could however be due to management removing the regular plants on my transect, resulting in an apparent gap in what is actually a constant species. Repeating the transects in 2018 would help clarify this! The winter or spring flowering specialists – these were from photographs taken throughout the year and not taken on the day – the dark start and lunchtime rain made photography difficult! Accounting for the various caveats in the data, there do appear to be three key categories to which the species flowering on my 2018 New Year Plant Hunt accord. Those which flower almost year-round; those which have a late flowering distribution which hangs on into winter; and those which are winter or early-spring flowering specialists. I totted up 31 species on the regular transect of the New Year Plant Hunt, which is just under 20% of the total number of species I recorded across the year. What is missing from the transect in January is a host of spring flowers which will not appear for another month or two (such as violets, naturalised spring bulbs and woodland species such as ramsons); the vast majority of the trees and grasses; and the dominant summer species which flowered between May and July (such as hedge parsley, meadowsweet and black knapweed). Also missing are some of the autumn specialists with shorter flowering seasons (including ivy, Russian vine and Michaelmas daisy). I do however hope to continue the transects through 2018 and build a more robust dataset over time as I think the context it adds to the new year plant hunt is quite an interesting one! Find out more about the BSBI’s 2018 New Year Plant Hunt results on their website here! The most recent issue of the Harlaxton Voice, the monthly newsletter for the village of Harlaxton a couple of miles to the west of Grantham, outlined the issues raised by the ‘Best Kept Village’ inspectors in 2012. Amongst their criticisms (although they were overall very impressed with the village), was the number of weeds. Many people may agree but I would offer a different view; I would hope that the village does not take this complaint too much to heart. 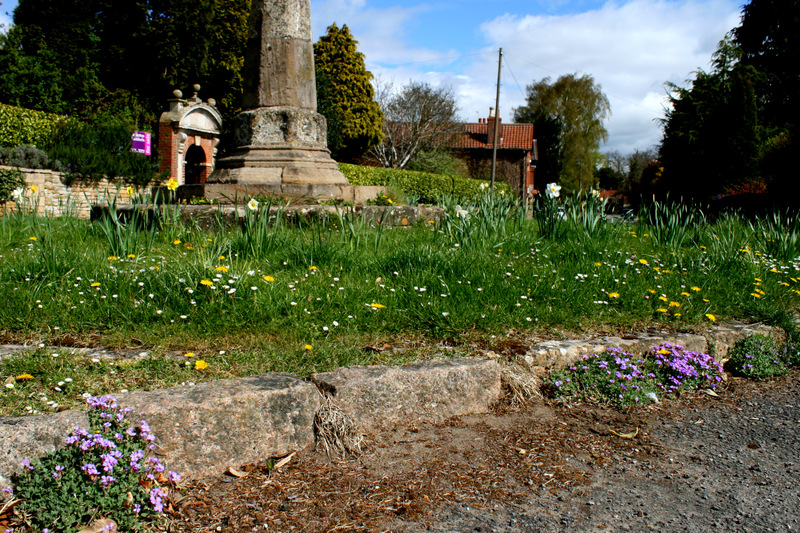 Harlaxton Monument; aubretia growing along the kerb edge, dandelions and daisys in the grass along with planted daffodils. Which are the weeds? I took a walk around the Harlaxton between the rain showers today for a quick survey of the unauthorised village vegetation. There are garden escapee’s; valarian growing in the walls, forget-me-nots forgetting to keep within the beds they were planted in, yellow corydalis and the beautiful and characteristic aubretia which bubbles and tumbles down the walls as you drive through. I would suspect that the committee would approve of these plants, they look sufficiently ornamental and their establishment within the village adds to its character. Then there are the colourful flowering species which may split opinions a little further; dandelions imitating the sporadic sun in the otherwise dismal tarmac, broad-leaf willow herb, purple-flowered violets, buttercup-yellow lesser celandines, yarrow, herb-robert and purple toad-flax. These all take foothold in tiny patches of soil where you would never expect a planted seed to grow; they live against the odds where little else could. My personal favourite is the exquisite creeping toadflax which creeps out of the gaps in the walls and trails down, a native accompaniment to the bolder aubretia. Dandelion growing in a crack in the pavement – a splash of sunshine with surprisingly few friends! Finally are those which would be sprayed off by most without a second thought; spear thistle, common chickweed, groundsel, cleavers, bittercress and ivy-leaved speedwell. These do flower but generally they are so small and unappealing to the casual observer that they would be dismissed as scrubby vegetation. But look a little closer and these too are beautiful plants. Weeds are defined as plants in the wrong place but the wrong place depends upon the viewpoint of the observer. There is no reason why our pavement edges should be sprayed clean of those opportunistic plants which have found a way to take a temporary root, add splashes of green to the tarmac and provide nectar sources for pollinators such as butterflies and bees. The inspection committee were pleased with the ‘tended beds’ – small squares of soil with specimen plants placed in the centre which I personally find rather dull. Are the daisy’s in the grass considered weeds? Some would say yes, some would say no. Weeds are a matter of aesthetics and I would hope that the village does not pander too much to the view of the itinerant inspectors who will not be visiting again for another year. I would say that the right place for our native wildflowers is wherever they can survive in our otherwise often too inert landscape but I suspect this is a minority viewpoint. The Best Kept Village Inspectors’ ideal?